If the sport is banned, farmers will be forced to abandon the raising of native livestock, which already stands threatened due to the extensive use of motor pumps, tractors and mechanised agriculture. Note: This article was first published on January 13, 2016. Imagine this scene a few thousand years ago in the Indus Valley region. A group of herders out grazing a few hundred cattle, enjoying the warm sun on their backs with the occasional cry of a calf seeking its mother and the mother guiding it. The whole herd is on the move as the lazy day passes by. Suddenly a bull decides to run astray. With wild animals lurking, there is the danger of the herd breaking up into smaller groups. A young herder emerges and chases the bull. Bulls being males high on testosterone run quite fast and finally the herder catches up with it. He lunges forward and holds onto the hump of the bull. The hump is a unique feature of Bos Indicus cattle. He manages to hold onto the hump, slowing the bull down and finally stopping it. He leads it back to the herd and the group continues, while showering praises on the young herder for catching the bull. Now imagine this scene repeated on a daily basis and the herders sharing the story with the villagers when they pen the cattle for the night. Over time, the skill of embracing the hump to slow the bull down is celebrated and contests are held to showcase the skill. This is called Eru Thazhuvuthal meaning ‘Embracing a Bull’. Indus Valley civilisation is known for being one of the most advanced and sophisticated amongst its contemporaries. 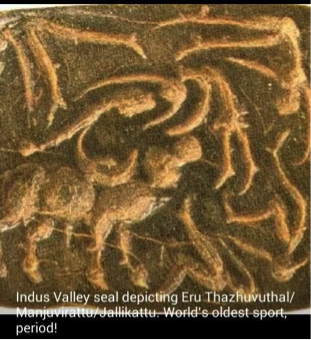 The sport of Eru Thazhuvathal is celebrated so much that they decide to make a seal depicting the same. During the rule of the Nayak kings, gold coins, wrapped in a piece of cloth were tied to the horns, and the tackler hung on to the hump of the bull and untied the knot to get at the prize. Jalli/salli means ‘coins’, and kattu is ‘tied’. A small bag of coins was tied to the horns of the bulls, which the players claimed as a prize. The only way you could do that was to embrace the hump of the bull long enough to grab the bag without getting hit. Now a token cloth is tied in the horns which the tackler collects as a trophy. The focal point of the event is the vaadi vaasal, the entrance. The bulls are let through this entrance, into the track, where the players wait. The track is usually the main street of the village, with the side lanes blocked. The event begins with the visit of village elders, led by a band drummer, to the temple of the village deity. The Koyil Kaalai (temple bull) of the host village is allowed first andm as a mark of respect and gratitude to the host village, players allow it a free run and don’t touch it. Today, educated youngsters from these villages are also involved in the rearing of bulls and participate in the sport. All classes of people and all castes take part in Jallikattu. There is an egalitarian perspective where it’s humans and their cattle, nothing more nothing less. 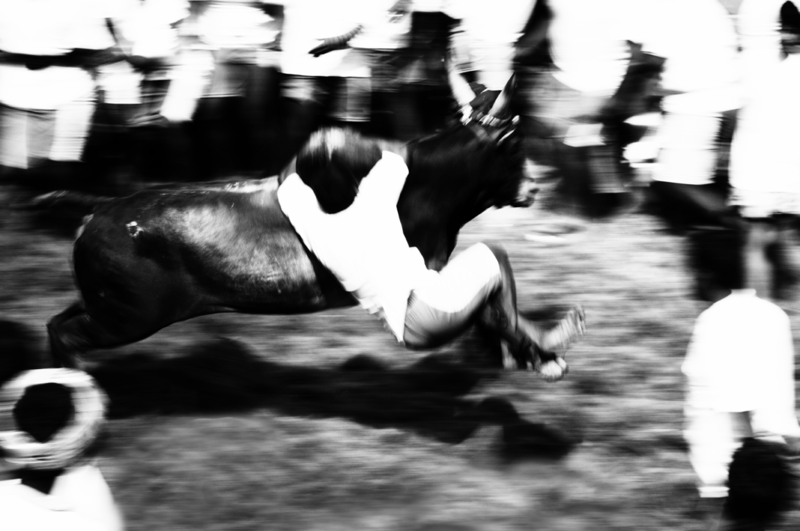 Jallikattu is an ancient sport. The seals of the Indus Valley civilisation depict it, which is proof that this sport was in vogue 5,000 years ago. Ancient Tamil poetry, known as Sangam literature (2nd BCE – 2nd CE), has many detailed references to Eru Thazhuvuthal (hugging the bull). The fact that English colonial administrators have also written about jallikattu tells us the sport was played continuously down the ages. For the following account of the jellikattu or bull-baiting, which is practiced by the Maravans, I am indebted to a note by Mr. J. H. Nelson. “This,” he writes, “is a game worthy of a bold and free people, and it is to be regretted that certain Collectors (District Magistrates) should have discouraged it under the idea that it was somewhat dangerous. The jellikattu is conducted in the following manner. On a certain day in the year, large crowds of people, chiefly males, assemble together in the morning in some extensive open space, the dry bed of a river perhaps, or of a tank (pond), and many of them may be seen leading ploughing bullocks, of which the sleek bodies and rather wicked eyes afford clear evidence of the extra diet they have received for some days in anticipation of the great event. The owners of these animals soon begin to brag of their strength and speed, and to challenge all and any to catch and hold them; and in a short time one of the best beasts is selected to open the day’s proceedings. A new cloth is made fast round his horns, to be the prize of his captor, and he is then led out into the midst of the arena by his owner, and there left to himself surrounded by a throng of shouting and excited strangers. Unaccustomed to this sort of treatment, and excited by the gestures of those who have undertaken to catch him, the bullock usually lowers his head at once, and charges wildly into the midst of the crowd, who nimbly run off on either side to make way for him. His speed being much greater than that of the men, he soon overtakes one of his enemies and makes at him to toss him savagely. Upon this the man drops on the sand like a stone, and the bullock, instead of goring him, leaps over his body, and rushes after another. The second man drops in his turn, and is passed like the first; and, after repeating this operation several times, the beast either succeeds in breaking the ring, and galloping off to his village, charging every person he meets on the way, or is at last caught and held by the most vigorous of his pursuers. Strange as it may seem, the bullocks never by any chance toss or gore any one who throws himself down on their approach; and the only danger arises from their accidentally reaching unseen and unheard some one who remains standing. This is concrete evidence to prove that jallikattu has been part of the long heritage of the country. One strong characteristic of life in India is the persistence of certain social institutions, the origins of which are lost in pre-history. Though the profile of these practices change, they retain their essential features. Jallikattu is one such precious heritage that has been preserved over millennia and our duty is to take this forward. 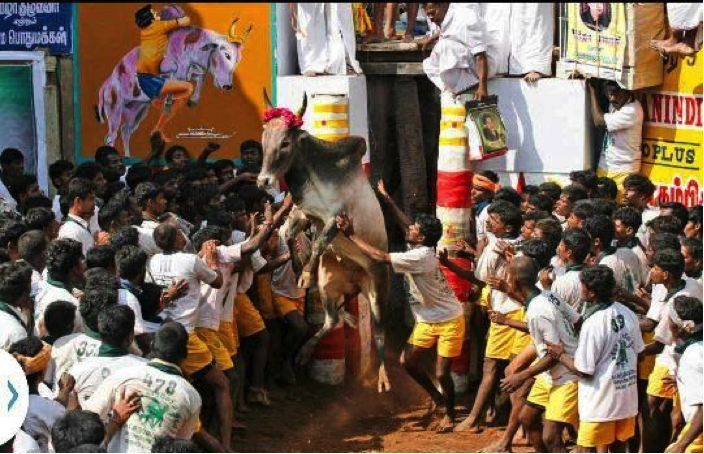 Of course we should have rules and restrictions for the conduct of the event but Jallikattu should go on. Tamil Nadu had six cattle breeds. These are Kangayam, Pulikulam, Umbalachery, Barugur, Alambadi and Malai Maadu. There are a few more minor breeds without proper documentation or care. Most of these are on the verge of extinction. Each breed has evolved in perfect harmony with its local region. Kangayams fed on grasses in the calcium rich soil are the sturdiest animals and can pull up to 2.5 times their body weight with ease. Umbalacherys have shorter legs which make it easy for them to walk around in the water filled fields of the delta region. Barugurs in the hills of Erode district and Malai Maadus in Theni district are grazed in reserve forests and are adept at walking around in hilly terrain. The Pulikulam, found mostly in the region around Madurai, Sivaganga, Ramnad, Pudukottai and parts of Tiruchi district are herded in several hundreds and walk all day grazing before being penned for the night. Native cattle have evolved over millennia, adapting to the local environmental conditions. They are an integral part of farming, especially for small and marginal farmers as they serve multiple purposes like ploughing, transportation, source for farmyard manure, organic treatments like panchagavya, jeevamritham, and as a source of A2 milk. The native cattle are both an input as well as insurance to the livestock keepers. In ancient Tamil and Sanskrit literature, cattle is considered as wealth. Cattle were measured as a unit of wealth. In the Tirukkural, education is considered to be wealth and the word used for wealth is madu, meaning cattle. So it has a socio-cultural connotation which denotes lives and livestock having co-existed and cultures having coined usages around them. 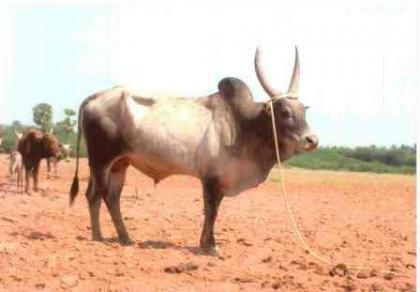 The Pulikulam is a semi-domesticated breed. The bulls are known to attack anyone except their owners. They are mainly grazed in reserve forest lands. Herders need to be able to tame them without ropes as the nose ropes are removed while grazing. How does one tame a bull without ropes? If you try to tackle it from the front, it will toss you with its horns; if you try to catch it from the back, it will kick with its legs. It’s also very agile and can turn around in a split second. The only option is to approach it from the side and grab the hump. Stud bulls are reared by people for jallikattu. The ones that win are much in demand for servicing the cows. Small farmers cannot afford to keep stud bulls, so each village has a common temple bull which services the cows of the village. Jallikattu is the show where bulls are brought and exhibited. The ones which are most agile (and virile) are preferred by farmers. The calves from such bulls are in demand. The intricate connect between these events and farming can be seen from the chronological order in which showcase events like jallikattu happen first, then the shandies and then the main farming season starts. Once harvest is done, farmers take their bulls to participate in such events over the next few months; spectators and visitors make a note of the top bulls and seek them out in sandhais (cattle shandies/markets) which happen from December till April all over Tamil Nadu. The calves and bulls are bought for jallikattu and some of their offspring will be castrated and used as draught animals in transport/farming. Stud bulls need to be alert, virile, and agile. In the peak of their reproductive period, they need to secrete the necessary male hormones and experience adrenalin rushes and pumping hearts. They need this for them to be virile. This is in the interest of the species as selective breeding is done to propagate the species. Stud bulls are used for jallikattu and mating only. Experienced bulls enjoy the situation and display a well thought out exit from the vaadi vaasal. Many of them show off by shaking their heads as a warning. This shows their familiarity with the Jallikattu event. Many people who care for animals don’t understand that nature creates each species with unique characteristics and behaviour, and that within a species, a bull, an ox, a cow and calf all are different. Male calves in other regions are sold and taken for slaughter in a few days. Only in regions where there are events like jallikattu are they kept. The owner of an imported cow will like it to deliver a female calf. If she does, it’s a windfall. If it’s a male calf then he will have no use for it and he has to feed it. It will go to the slaughter house for Rs. 500. A lot of mutton we eat is the meat of these under-one-week calves mixed with mutton. The same will happen to these native breeds if not for activities like jallikattu. With reduced availability of males, farmers will have to go in for artificial insemination, which is cost prohibitive and is directly in contravention of in-situ conservation. Unless there are bulls being bred and reared in the in-situ region, the genetic pool of the breed will not be healthy as no adaptation to changes in climate, local environment has been ingrained. We are messing with evolution when we abandon in-situ conservation with bulls and natural servicing/mating. Native cows do not yield as much milk as the imported breeds. So they don’t have a supportive or sponsored breeding programme. Artificial means are not adopted for native breeds. So as a fall out of the banning of jallikattu, they will soon fade away and become extinct. Death of a temple bull covers the village in a pall of gloom. 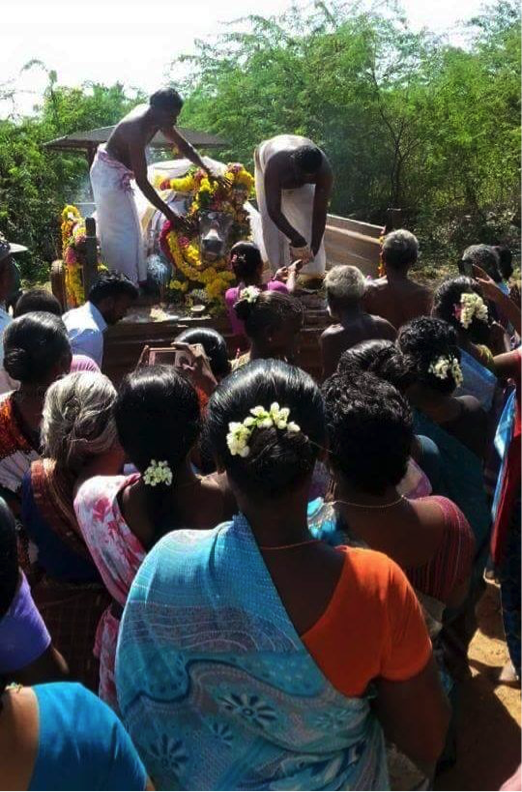 The funeral is conducted with utmost respect with women mourning and village priests carrying out rituals. Under article 48 of the constitution of India the state has to endeavour to preserve and improve the breeds and prevent slaughter of cows and calves and other draught and milk cattle. Hence the Union government has to intervene in this issue. According to principles 1, 2 & 3 of the Convention on Biological Diversity (CBD), to which India is a signatory state, livestock keepers are creators of breeds and custodians of animal genetic resources for food and agriculture; livestock keepers and the sustainable use of traditional breeds are dependent on the conservation of their respective ecosystems; traditional breeds represent collective property, they are the products of indigenous knowledge and the cultural expression of livestock keepers. Why is there so much opposition to jallikattu? There are two angles to the opposition. First is the urban disconnect with rural India and all that it entails. Policies are made by city folk. Just as we destroyed the lakes of Chennai and suffered the consequences of ignoring the traditional knowledge of villagers in building and maintaining water bodies, we are allowing the same urban mindset to get away with rampant destruction of our livestock and farming. If we look at media reports over the last decade or so, every headline screams about injuries in a jallikattu event. The focus of the urban editors and reporters has always been on sensationalising news and grabbing eyeballs. Fed with this constant diet over a decade, it’s no surprise that so many internet warriors are shouting about jallikattu. 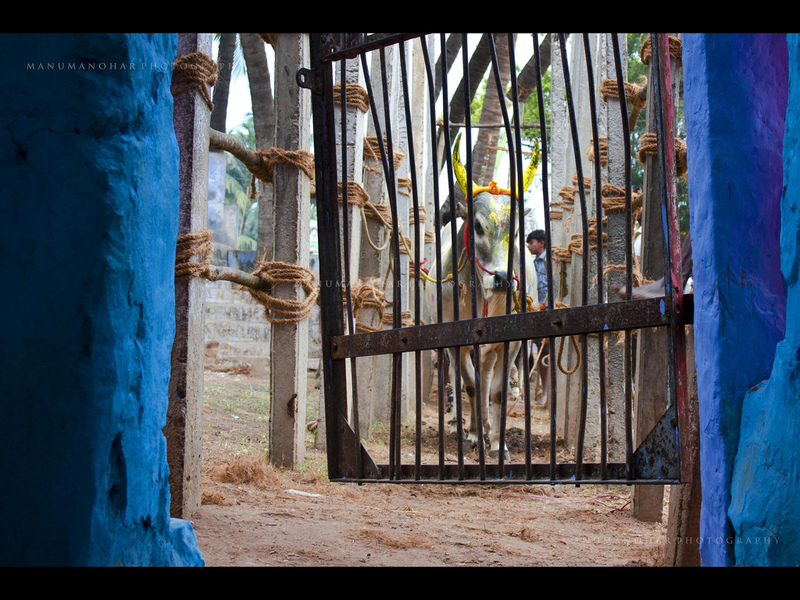 In a year, there are 10,000 instances of a bull leaving the vaadi vaasal (gate) during jallikattu. Of the thousands of players who take part, hardly 50-100 get injured in a year, and deaths are much much less. The second group is the dairy lobby, which wants all native breeds to be eradicated. Events like jallikattu throw a spanner in their plans of creating commercial dairy farms with imported breeds just like in the West. Beef exporters also benefit from a ban on jallikattu and other events. Farmers bring their cattle to be sold in weekly/monthly and annual shandies. Brokers will take the cattle from the farmers and hold them to be displayed to prospective buyers. Buyers fall into 3-4 categories: (1) The jallikattu enthusiast who will buy the bulls and male calves mostly; (2) Buyers of oxen for farming/transport; (3) Buyers of cows for breeding and household usage; (4) Beef traders who are mostly if not all agents of export companies and slaughter houses based in Kerala. They buy all cattle as they are only interested in meat. When a ban on jallikattu is in place, the simple supply-demand equation gets skewed. There are no takers in the first category, which means the bulls will only sought by the fourth category i.e. beef traders. With no demand from jallikattu enthusiasts, the price of such prized bulls falls to rock bottom. By killing the market for bulls to be used in jallikattu, the animal rights activists are directly responsible for sending them to slaughter. There is a huge demand for Bos Indicus variety beef in the Gulf, Malaysia and Western countries. It is considered an exotic and healthy meat, just like country chicken. 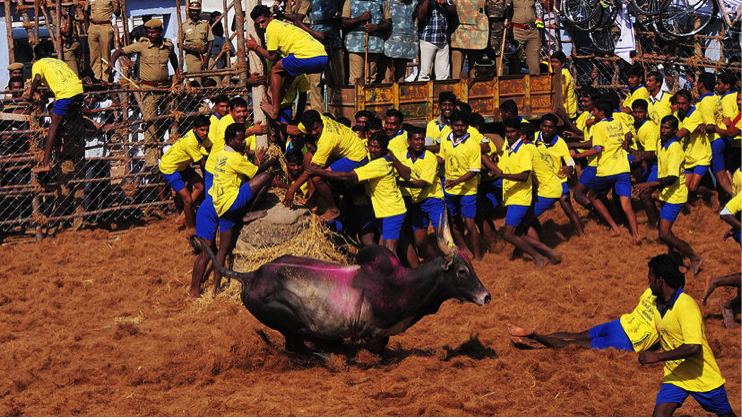 The fist misconception is that jallikattu has anything in common with the Spanish bullfight. The two are very different. The sport in India is not about baiting or injuring the bull but of “embracing the bull”. Does it harm the bull? It is said that cruelty is meted out to animals by giving them alcohol, prodding and twisting their tails etc, that organisers beat the bulls, stuffing something pungent in their nostrils, confine them in a dark, suffocating place in order to enrage them. The reality is different. Amidst all the regulations and scrutiny, which bull owner will risk giving alcohol to the bulls? Glucose water is given to them for stamina. Out of the 10,000 instances of bulls let out a year, the anti-jallikattu activists have produced images/videos of may be 7-8 bulls where an offence might have taken place. They have the power to identify the owner and take action against him under the Prevention of Cruelty to Animals Act. Each bull is registered with the authorities, with photographs as well as the owner’s information. Every rule has an exception. We regulate to curtail the exceptions, but not to end the sport. The approach of the activists from day one has been to end jallikattu at any cost. Are there other means of conserving the breeds? Each breed has evolved over several millennia and in a distinct way. One method of breed conservation will not work in another area, with another breed. 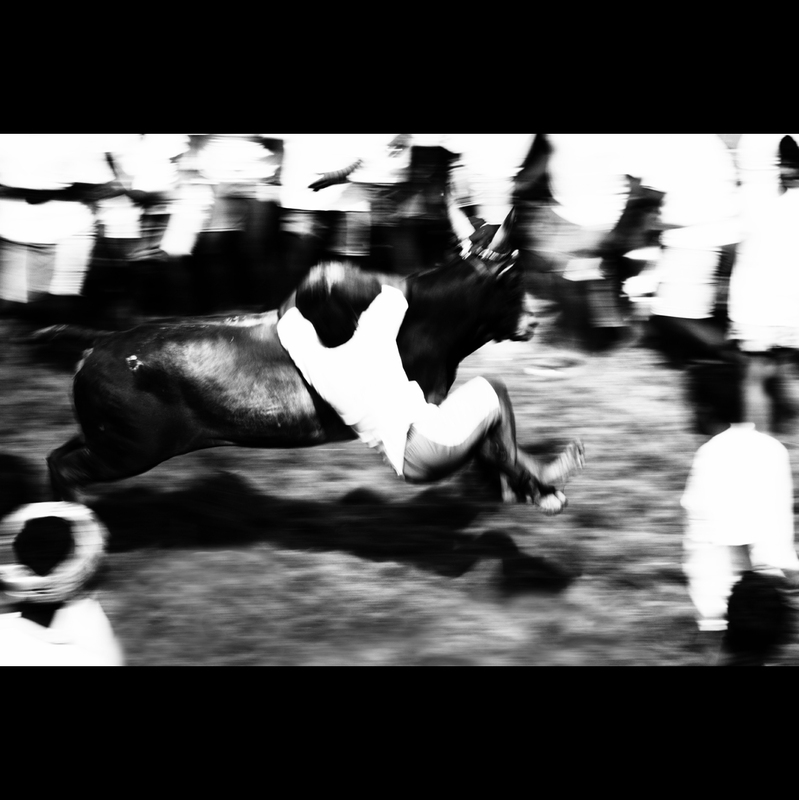 Every place in the world where indigenous people have lived with their livestock, there are celebratory showcase events post-harvest like kambala buffalo water racing in the Dakshin Kannada region, Ongole stone pulling in central and coastal Andhra, rekla races in western Tamil Nadu and Theni, bailgada in Maharashtra with the Killari breed. Each event has evolved locally and has stood the test of time. In-situ conservation is the best method for conserving any breed. The lifetime and health of the species is extended only due to such events. Bulls are brought to the arena the previous day and tied in coconut groves around the village. Fodder is brought along and water is provided by the host villagers. Sometimes fodder is also provided. A team of veterinarians, animal welfare officials inspect the bulls and give a medical certificate. Before the event starts, they are lined up in batches of 15 close to the rear side of the vaadi vaasal. After the temple bull of the host village has left the arena, each bull is taken into the vaadi vaasal, where Animal Welfare officers are present. The nose rope of the bull is cut and the bull is free to run. Young bulls and untrained ones participating for the first few times hesitate to leave the vaadi and are prodded by their owners. It is not easy to move them as they weigh anywhere between 250-350 kilos. The experienced bulls (which have long memories) are familiar with jallikattu events and offer their head to the owners to cut the rope. They plan their exit from the vaadi vaasal and time their jump to avoid the players. These are intelligent animals and have evolved in this environment over millennia. The sport consists of holding on to the hump of the bull and running along with it for a given distance usually about 20-30 meters which is covered in barely 10-20 seconds. Although a few hundred players are present in the arena, only 2-3 attempt to get close to the bull and only 1 has a shot at grabbing the hump. Everything happens so fast that most players hit the dirt and the bulls go free. After leaving the arena, they go to a barricaded collection area of about 44,000 sq. ft. where experienced herders await the owners. Owners follow the bulls from the vaadi into the collection arena, this takes about 5-10 minutes. Once they enter, the herders help the owners rope in the bulls and take them out of the collection arena. 1-2 bulls will refuse to be roped and charge at everyone, some of them jump out of the collection area and make a run for it. Most of them head in the direction of their villages. There is the occasional injury due to the bulls not being roped. Under the Convention on Biological Diversity and heritage status practices worldwide, it is customary that these ancient traditional practices are left as they are but with rules to organise and regulate them. If jallikattu is banned, livestock keepers will be forced to abandon the raising of native livestock, which already stands threatened due to the extensive use of motor pumps, tractors and mechanised agriculture. 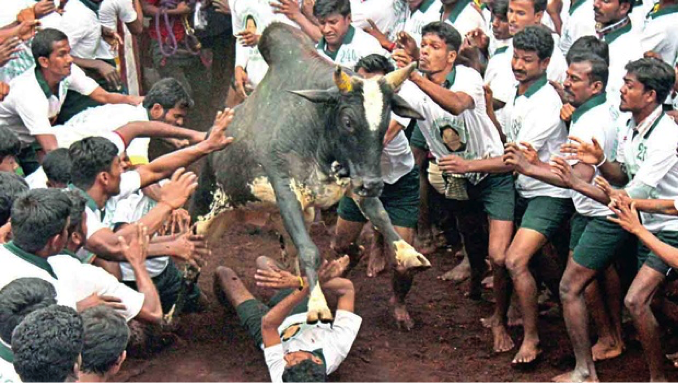 If the sport is banned, it would be the death knell of native cattle species in Tamil Nadu. We will not only lose our breeds but also our self-sufficiency in milk production as well as promotion of organic farming. If we lose our breeds and import foreign breeds, multinational commercial companies will dominate the dairy industry in India. The livelihood of millions in rural India is at stake here. People who want a ban on jallikattu are far removed from village life and do not know how this chain works. The Supreme Court and the Government of India needs to look at the big picture behind jallikattu. The Convention on Biological Diversity (CBD) supports traditional practices to keep the chain intact and thus enable conservation of native breeds. As an ancient nation with an ancient practice going back millennia, jallikattu should be preserved. There is no torture of any animal of any sort that takes place during the sport and the evidence of this can be seen from live media telecasts. The time a bull spends engaged in the sport is less than 30 seconds. If required, rules can be implemented to enhance the safety of the animals and men if required. India has already lost many cattle breeds and it can’t afford to lose any more. Himakiran Anugula is an organic farmer and entrepreneur based in Chennai. He is a trustee of SKCRF (www.kangayambull.com), an organisation working to conserve native breed cattle in Tamil Nadu. Note: This article has been edited to correct the claim that the Alambadi cattle breed in Tamil Nadu is extinct. This is not the case and the government has an active programme to conserve the Alambadi and other indigenous cattle breeds.